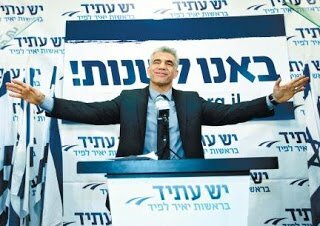 The politician Yair Lapid looking looking very happy, "suave" and may we say a bit "vain" about the outcome of the recent elections. A new year and another turn to host Haveil Havalim - a carnival of Jewish and Israeli blogs.The Haveil Havalim blog carnival was founded by Soccer Dad and every week a different blogger takes a turn to host a weekly collection of blog posts. The name "Haveil Havalim" means "Vanity of the Vanities" and is taken from the book Ecclesiates in the Tanach (the Jewish Bible). If you blog about Israel or Jewish-related subjects, please feel free to join the Haveil Havalim Facebook group or go and have a look at the Haveil Havalim website. As always, life in Israel has not been boring. We have had some extreme weather (rain, rain, lots of rain, SNOW!, lots of rain again) an election (always an extreme event in Israel) and we planted trees. Yup, you have read correctly! It was the Jewish holiday of Tu b'Shvat which is celebrated by planting trees. A lot of trees got damaged by the heavy weather and having a day to plant trees for the future generations right after, just seemed so poetic to me. Just look at all of Ruti Mizrachi's (from Ki Yachol Nuchal) snow photos in A Week in Weather in Pictures. One cannot believe that these photos were taken in Israel! In the Real Jerusalem Streets, at the post Warm Story for a Cold Week you can see a photo of the damaged trees but also photos of a very special wedding. Go and have a look! In the blog Jewish Israel we read about how the Pope is to get a seat over the Tomb of King David. This 'seat' is in a room of a 12th century Crusader structure which is built on top of the traditional Tomb of King David. Many Christians (of various demonations) believe the room to be the location of the last supper but the Catholic church have been trying to gain ownership of it for years. Jacob Richman from Good News from Israel has made a new learn Hebrew video about the southern Israeli city of Eilat. Jacob has also created English/ Hebrew vocabulary sheets with words related to American football at Prepare for the Superbowl. At Esser Agaroth we get 2 cents worth of opinion on Ambassador Dan "the Man" Shapiro, the football fan. West Bank Mama in The "Unsung" Heroines tells us why she does not think that a young religious woman should take part in a singing competition on television. This young woman caused a lot of debate in Israel, and the various opinions are reflected in the blog post's comments. Shlomo from Thinking Torah gives us a Torah lesson in leadership in Learning How to Lead. His lesson is based on Parshat Yitro which is in the Jewish Bible book of Exodus, chapters 18-20. Esser Agaroth tells us why he does not want Yair Lapid as Internal Affairs minister in Internal Affairs Minister Lapid? No thanks? Newcomer Yair Lapid won a surprising number of votes in the recent election. The New York Times calls him a "suave, handsome journalist-turned-populist-politician." And no, I did not vote for him...but I do agree with the "suave" description. Batya Madad from Shiloh Musings also talks about politics in Interim Arab Terrorism, Israel Needs a New Coalition ASAP. So many things happening, so many opinions...yes, life in Israel is NOT boring at all. Hope you enjoyed this issue of Haveil Havelim! Thanks for hosting and for including my submissions! Haveil Havalim #397 Is Up! Thanks so much for your Havel Havelim and including my post. Thanks for hosting and including my blog posts. If you need a hint with the word search puzzle, just ask!